Hello! This is Amy Shawley Paquette and I'm so excited to be a guest blogger for StencilGirl! Some of my favorite art techniques are drawing, printmaking and building paint textures, so I've put together a tutorial on how to combine these ideas with stencils by making "Illustrated Ghosts." 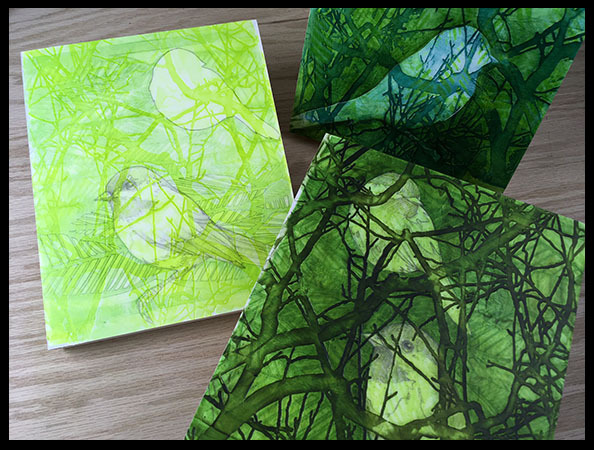 For this post I'll be featuring some projects that involve building an image in layers, starting with some lovely ghost prints then working over them with graphite pencil and a stenciled relief texture using acrylic gels! with my own drawings and hand-cut masks! Watch Illustrated Ghosts on YouTube here. Here I printed out an image of one of my watercolor paintings on to cardstock, I have also hand drawn my own masks but it is super easy to work from art that you've already done and fun to see how you can simplify and repurpose your own designs! Use an Xacto knife to cut out your image(s) and be sure to keep the cardstock with the cut out shape as you can use this as a stencil too. 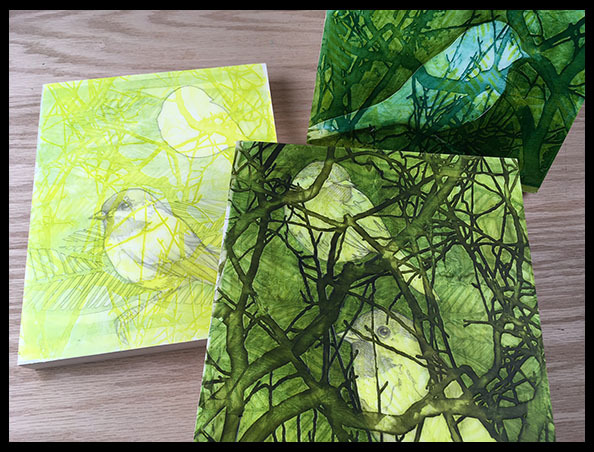 Use a brayer to roll out some Golden OPEN acrylic onto a printing plate. For my first layer I used Green Gold, I love how brilliant this color is when it goes on thin! Lay down the Clustered Leaves stencil on the printing plate, then lay Stonehenge paper on top and apply pressure with your hand to pull the first print, this one will have harder edges and more white space on the paper. After printing, remove the stencil then pull the remaining color or "ghost" print on another sheet of Stonehenge - these are my favorite prints and the ones we will work with for the rest of this tutorial! 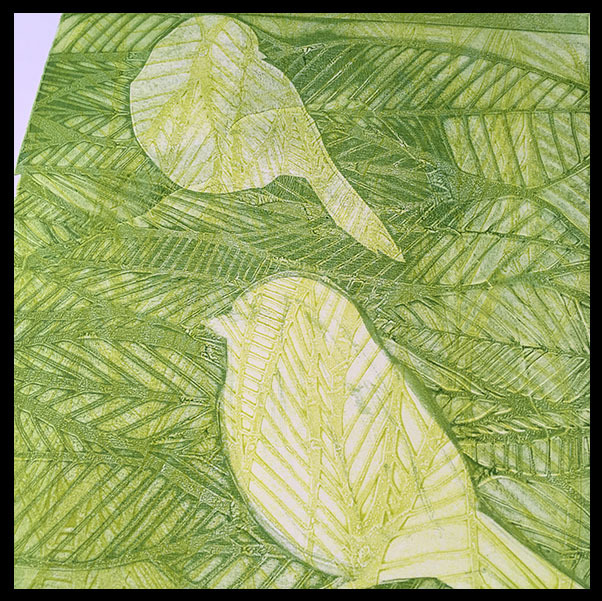 Roll a second color of Golden OPEN acrylic onto the printing plate, here I used Jenkins Green. Once the color is down, lay in your masks then place the Clustered Leaves stencil down in the opposite direction from the first print to create more variety with the line work. Lay your Stonehenge paper with the first print from Step 2 over the printing plate, then use a rolling pin to apply pressure to the backside of the paper for lifting your print, this helps work around all of the raised stencil and mask surfaces. 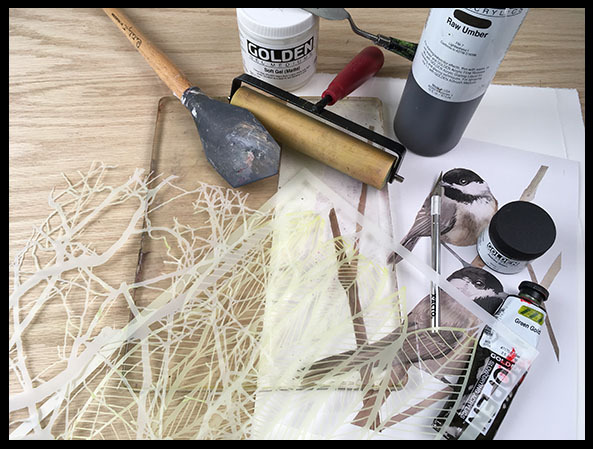 Remove the stencil and masks from the printing plate then use a brush with a touch of water in it (also try a damp paper towel) to lift out the rest of the paint from the masked area only - this will allow for a crisper image on the next print. Print this ghost over the ghost print from Step 2. This will give you a two layered print that has fainter color and softer, dreamy edges but retains great line quality! Let the paint dry completely before moving onto the next step! 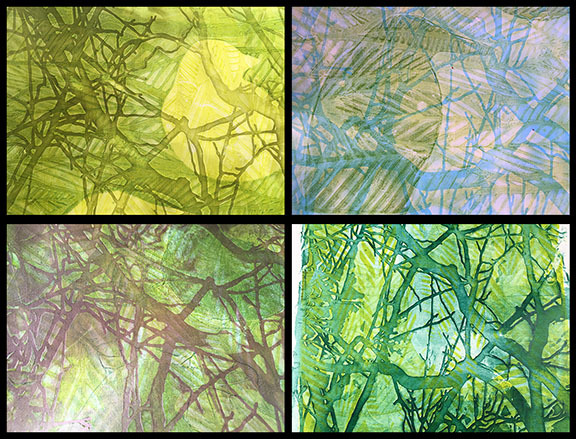 Step 4: Create a layer of Translucent Stenciled Texture over your Layered Ghost Print! Spice up your print by adding a layer of texture! 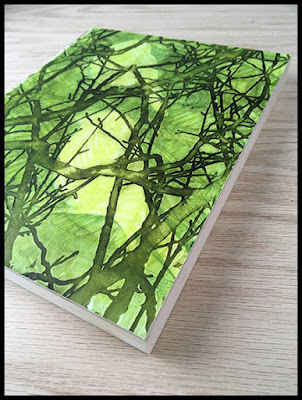 Lay the Thicket Background stencil over your print, be sure to line it up so that your masked areas peek through. Using a painting knife, drag a thin layer of Golden's Soft Gel Matte over the stencil, then lift the stencil and see how the gel keeps your edges! Any thickness or sheen of gel works here but Soft Gel Matte is my favorite, especially in a thin layer - it reminds me of encaustic wax! Let this layer dry completely before moving onto the next step, due to the thickness of the gel and environmental conditions of where you are painting (humidity, etc), this could take a few hours to a day or more. Enhance your raised stencil by filling in the positive space with a tinted gel. Here I used two colors of Golden Fluid acrylic in a recipe of 80% Sap Green Hue and 20% Raw Umber to tint the Soft Gel Matte - the overall recipe was about 3-4 drops of paint color to roughly 1oz of gel, this darkened the gel just enough without it being too opaque. 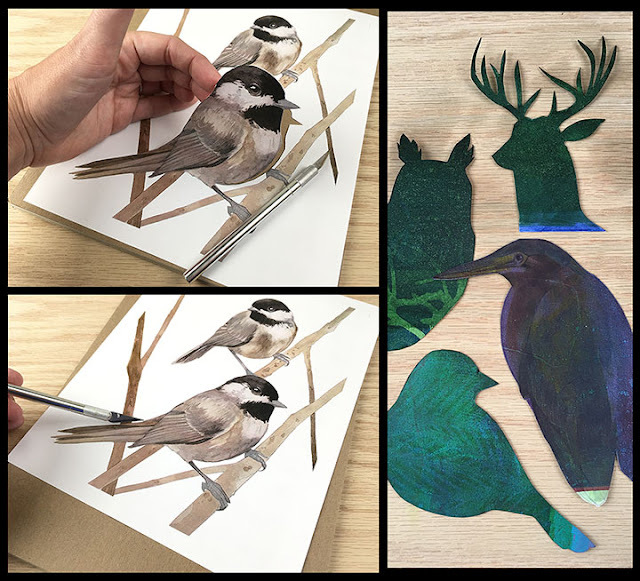 Use a silicone blade or rubber spatula to "squeegee" the tinted gel into the valleys of the stencil texture and watch how the image comes to life! Take a look at some other color ideas! Vary the amount of color in your gel to get a range of transparent and opacity. Step 6: Refine the look by Adhering your Image to a Wood Panel! Choose a size and shape of wood panel to compliment your design, here I'm working on an 8" x 10" inch size. Line up your textured ghost print on the panel and figure out your placement, then turn the panel and paper over to draw registration lines in graphite pencil on the back of the paper. Use an acrylic gel as your adhesive for the paper, I chose Golden's Heavy Gel Gloss, due to its thicker viscosity your paper won't slide around much. Spread the gel around the bare panel with a painting knife and make sure it is about 1/8" thick, then lay the panel down onto the back of your Stonehenge paper between the registration lines you drew. Flip the whole thing over and use a clean brayer with medium pressure to roll out your air bubbles and distribute the gel. If there is any extra gel that squishes out, scrape it off with a painting knife and put it back in the jar! Let the gel dry, then use an Xacto knife and trim the paper so that its edge is flush with the wood panel. Step 7: Embellish the Image! Here I added a thin layer of Golden's Matte Medium to create a subtle "tooth" to my surface that will pick up pencil lines - try a combination of graphite pencils, I also love watercolor pencils on this surface! On this panel, I brought back in some illustrated detail to the spaces inside my masked bird areas. For an alternative approach, draw with graphite pencil on your ghost print before adding the stenciled gel texture! When you add the tinted gel, use a lighter/transparent color or a more diluted color mixture with the gel so that your layers stay transparent and you can see your drawing/illustration underneath. Here I used Green Gold. Another approach is to skip drawing all together and use the paper with your mask cut out as a stencil and create a raised texture shape - pictured here are my birds. This is a simple way to incorporate a hard edged shape from one of your illustrations without the need for additional drawing tools! Scrape acrylic gel over the stencil to make your shape then let dry. Use a paintbrush and darken the area around the raised gel with color to enhance your shape! When working with a limited palette of color and a small range of materials, the additional embellishment techniques allow you to play with the variables and build a series of images that relate to each other! I also invite you to stay in touch with me via my social media links below! Amy Shawley Paquette is a Virginia-based visual artist whose painting and illustration is inspired by the natural world. Her work incorporates fauna, flora, landscapes, and textures she has encountered during her travels and everyday life. 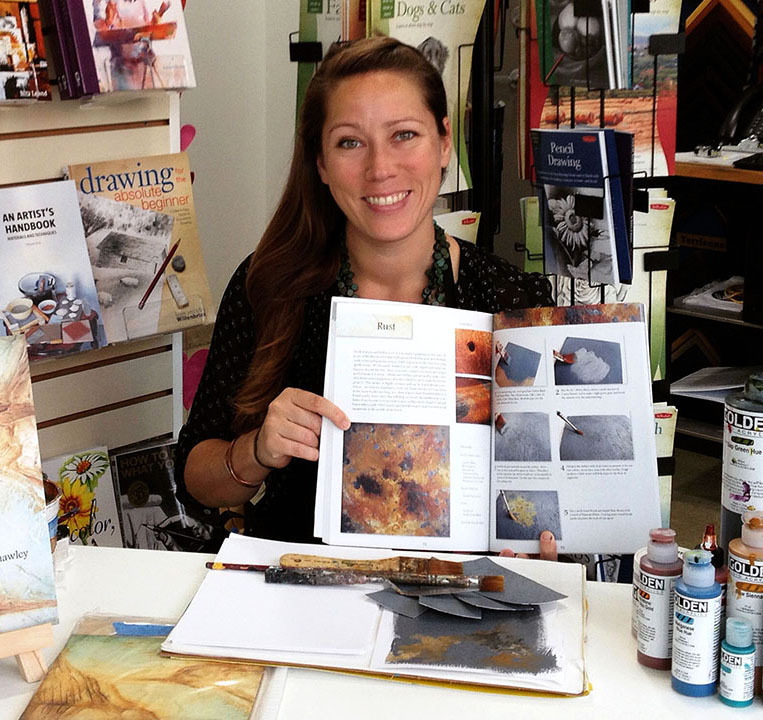 For the last ten years, Amy has been teaching in the Working Artist Program for Golden Artist Colors and in 2016 was trained to be an educator for Williamsburg Oils. She currently offers painting lectures on acrylic, watercolor, and oil in Virginia, DC, Maryland, and Delaware. Amy also teaches art workshops nationally, offers online education, and published her first painting technique book in 2015. What a great tutorial! It looks fabulous! I love this project! The video was great! Wow - so many options - Thanks for the video - always appreciate those.